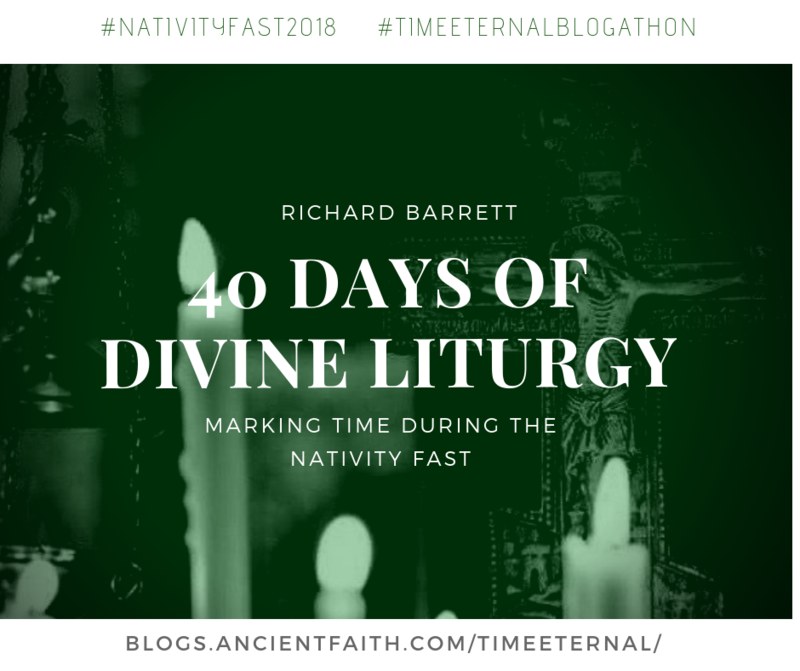 Welcome to Day 14 of the Nativity Fast (NC)! (Has it really only been two weeks?) In this morning’s edition of the blogathon, Richard Barrett, executive director of AGES Initiatives, shares with us what he’s learned in recent years about the tradition of Saranteleitourgo. If you have no idea what that means, keep reading–you won’t be disappointed. “A what, now?” I understood that somehow we were talking about the number forty and liturgy, but I had never heard the term before. There is a tradition of a forty day period of daily Divine Liturgies in multiple contexts in the Orthodox world: it is customary for newly-ordained priests to celebrate daily for the first forty days after their ordination, it can be offered for the living and the departed, and it can be an observance of the Nativity Fast. The Nativity Fast observance appears to be a Greek practice primarily, although Slavs will offer forty Divine Liturgies (Sorokoust, a title that borrows the Greek word for forty) for the living and the dead. To offer forty Divine Liturgies before Christmas is a marked difference in character between the Nativity Fast and Great Lent. During the Triodion period, the Church’s normative liturgical practice is to allow Divine Liturgy only on Saturday and Sunday, save for the feast of the Annunciation and the Wednesday and Friday of the week after Meatfare; this is why we have Liturgies of the Presanctified Gifts during Lent. Forty Divine Liturgies are impossible during this fast. For the forty days before Christmas, however, there is no barrier to serving a daily Divine Liturgy. Thus, for the last four winter fasts, my priest has ensured that we have done exactly that. To be clear, unless there is a significant feast or saint appointed — the Entrance of the Virgin, for example, or St. Katherine or St. Nicholas — we are not serving a full morning cycle every day. For my priest, the ideal morning for one of these Divine Liturgies is as follows: somebody will be there at 8am to read Ninth Hour with him, I will be there by 8:30am to chant the Divine Liturgy, I am to be intentional about chanting brief settings and those briskly, he will give a short homily if he gives one at all, and we will be finished in an hour. (It helps that starting last year, my employer, AGES Initiatives, began including Vespers, Orthros, and Divine Liturgy for every day of the fast in our online offering of service texts.) It is not meant to be a chore, my priest says, but rather sustenance, and if it is too many people are more likely not to come. A chore it largely was for me and family the first couple of years; during the first fast, I had a day job with a strict schedule, and it was unrealistic for me to be able to be there more than one or two days a week. Even in subsequent years when my schedule has been more flexible, it is a commitment that requires effort and discipline from my whole family for it to work. We live almost a half hour away from the parish in no traffic; in Boston weekday morning traffic, it is more like an hour. In addition, it is up to me to get our daughter Katherine to preschool on my way to church, a full two hours before we get here there normally. The trip home afterward is certainly easier, but then I have to deal with an abbreviated workday. There is a cost. Nonetheless, daily services are an immeasurable blessing for me. At my first parish, our normal schedule was daily Vespers Tuesday and Thursday, Great Vespers Saturday evening, and Matins and Divine Liturgy Sunday morning — plus feasts and major saints’ days. 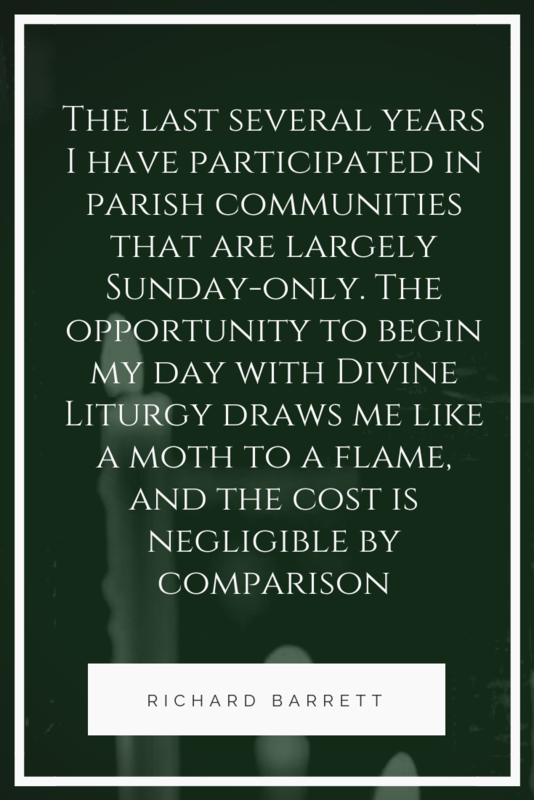 That has been a schedule that has been steadily eroded over the years, first at that parish and then at later parishes, and the last several years I have participated in parish communities that are largely Sunday-only. The opportunity to begin my day with Divine Liturgy draws me like a moth to a flame, and the cost is negligible by comparison. It is a commonplace to distinguish between two different senses of time embedded into our liturgical language. There is chronos, the time measured by our clocks, the world’s time; there is also kairos, or the timelessness we ought to experience in church — Καιρός τοῦ ποιῆσαι τῷ Κυρίῳ (“It is time for the Lord to act,” as the deacon says at the beginning of the Divine Liturgy). For me, the forty Divine Liturgies of the Nativity Fast are an opportunity to experience more fully as kairos a period that has come to be largely defined by chronos. On the 21st of November, the Entrance of the Virgin, the Christmas Katavasies are sung, and “Christ is born! Glorify him!” is proclaimed for the first time of the season. Shortly thereafter, the Kontakion for the Forefeast of Christmas is sung for the first time. The daily experience begins to feel somewhat like a dream by the middle of December, and by the time the Royal Hours of Christmas roll around, I can hardly believe that the season is nearly over. If I am honest about it, my mornings during the Nativity Fast are really little more than a temporary shelter, a brief respite rather than a turning of the tide. Even so, the routine of that brief respite on a daily basis makes the daily Divine Liturgies a treasure that I look forward to now, and make me grateful for the daily services that are offered outside of this season. Even if you do not attend a parish that observes Sarantaleitourgo during the Fast, I encourage you to take advantage of whatever additional services may be offered. I believe you will find that they add tremendous clarity to the journey and meaning of the season. Richard Barrett is protopsaltis of Holy Dormition Greek Orthodox Church in Somerville, MA. He has a B. Mus. 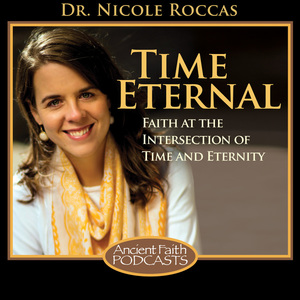 in Vocal Performance from the Indiana University Jacobs School of Music, and is a PhD candidate in Byzantine and medieval history at Indiana University, with additional work in ethnomusicology and Modern Greek Studies. Previous to joining the AGES staff, he was Director of Development for Suzuki School of Newton. In 2010 he founded the Saint John of Damascus Society, which supports public outreach and educational activities related to Orthodox liturgical music. Richard is also the co-host of one of Ancient Faith Radio’s newest podcasts, A Sacrifice of Praise.